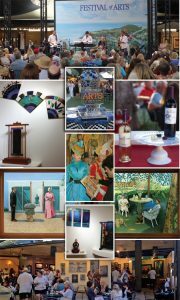 Today is the final Art, Jazz, Wine & Chocolate show at Festival of Arts in Laguna Beach, California. It’s also the conclusion of jazz performances at the 80-plus-year-old festival in Laguna Beach, California, which also features the spectacular Pageant of the Masters. However, a variety of music will accompany the more than 140 art exhibits daily until this year’s conclusion on Wednesday, Aug. 31. Throughout its 2016 run, which began on July 5, an expansive palette of other special events and activities were offered to festivalgoers. These include Concerts on the Green, Sunday in the Park Music Series, Rising Stars Music Series, Books and Brunch and Festival Runway Fashion. Check out my review of this summer’s festivities, which began on July 5, in “Notes from the Publisher” in the August-September issue of Smooth Jazz News. Read it in print or the digital version online at www.smoothjazznews.com. For more information on Festival of Arts and Pageant of the Masters, located at 650 Laguna Canyon Road, Laguna Beach, California, visit www.foapom.com or call 800-487-3378. This entry was posted in Art, Books and Author Events, Concerts and Festivals and tagged Art, Chocolate, Festival of Arts, Jazz, Laguna Beach, Wine on August 25, 2016 by Melanie.